Home Life Publishing Co. The City of New York Northern Part of the Borough of Manhattan and part of the Borough of the Bronx / Home Life Publishing Co. The City of New York South Part of the Borough of Manhattan. 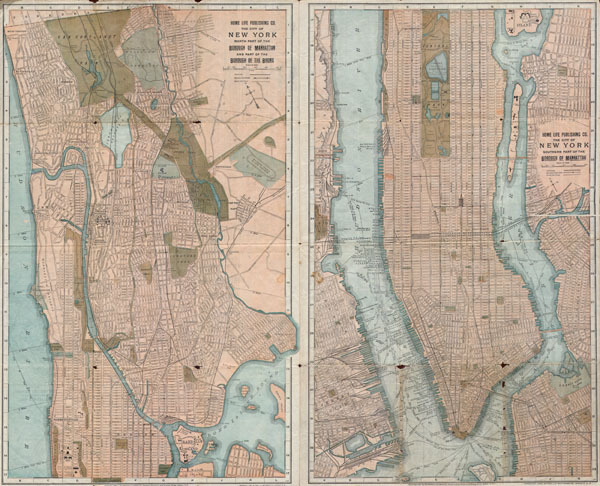 This is an unusual 1899 Map of Manhattan and the Bronx by the Home Life publishing company. It is based upon a very similar c. 1860 map of New York City by Fisk and Russell. This is one of the rare 19th century New York City maps to focus on Northern Manhattan and the Bronx. Covers the city in considerable detail to the level that even important buildings and parks are noted. Dated and copyrighted at the bottom, 1899. Good condition. A few minor chips to the margins and separations on roginal folds. Else good.